There aren’t many black people who live in Salt Lake County. 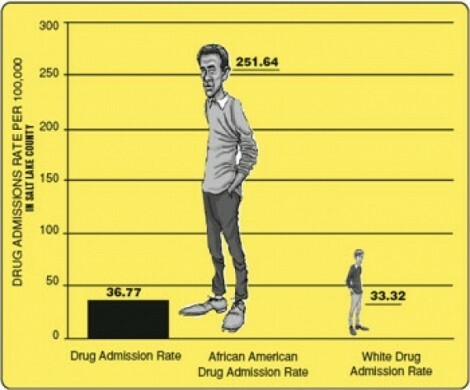 But those who do are more likely to be imprisoned on drug charges than their white neighbors. Eight times more likely, according to a new national study. And it isn’t because Salt Lake County’s black residents are eight times more likely to use or to sell drugs. In Utah, as in much of the nation, whites are just as likely to use drugs as blacks, research shows. But blacks are much more likely to wind up in prison for drug involvement, according to a study from the Washington, D.C.-based Justice Policy Institute. The findings don’t surprise Duane Bourdeaux, who retired from the Utah Legislature in 2006 following years of abortive attempts to get fellow lawmakers to study racial profiling. The Justice Policy Institute examined prison data for all large counties in the country. In Salt Lake County, it found that, for every 100,000 in the population, 252 blacks went to prison for drug crimes. That compares to 33 whites. The county had 1.6 percent blacks in 2002, the year studied. That disparity isn’t as bad as California’s San Francisco County, where blacks had a 1-in-10 chance of being imprisoned for a drug crime. But the numbers still place Salt Lake County in the top half of counties for highest black-imprisonment rates. Among the 198 largest counties in the nation, Salt Lake County ranked 88th highest for black-imprisonment rates. That said, the gap between black and white incarceration rates in Salt Lake County was smaller than most. While Salt Lake County blacks were imprisoned for drugs at eight times the rate of white residents, one county in New York had a black imprisonment rate 99 times larger than for whites. The institute recommends systemwide reform. Suggestions include collecting data on fairness of drug law enforcement and balancing spending on law enforcement with public-health approaches to drugs. Utah County is listed as one of only five in the nation where the Justice Policy Institute found no evidence of racial disparity in drug imprisonment. The county was only 0.6 percent black in 2002, the studied year, and no blacks were put in prison. Utah County also had the lowest reported drug-use rate in the nation, with 5 percent of residents reportedly using. The study’s authors write the arrest-rate gap shows there is prejudice in the criminal-justice system. Where is harder to figure out. Salt Lake City Prosecutor Sim Gill notes there are many points between arrest and sentencing where racial and ethnic biasas can show up: from the resident who calls suspected crime in to police, to arresting officers, to prosecutors, to bureaucrats who evaluate prisoners, to judges. Gill doesn’t believe any part of the county’s criminal justice system is intentionally targeting minorities. “But, is there institutional racism that enters at an unconscious level?” he asks. “Maybe.” Gill counts himself among those upset that statewide efforts to examine the system for prejudice have been sidelined. Bourdeaux got a bill passed in 2002 that required police to note the race of drivers pulled over in traffic stops. Fellow lawmakers shelved the law after determining police agencies were collecting the wrong data. A second, broader attempt to look at race and justice got going around the same time. The Commission on Racial and Ethnic Fairness in the Criminal and Juvenile Justice System brought together law enforcement and minority communities. “We had all the stakeholders there. We were doing tremendous, important work,” says Gill. “It was allowed to die on the vine.” The group was mothballed in 2005 for lack of funding from the Legislature. Bourdeaux tried to bring it back in 2006, but his $36,000 proposal died. While the commission was still meeting, Gill volunteered his prosecutor’s office to be studied for racial inequities. The study, by the Utah Commission on Criminal and Juvenile Justice, tracked minorities referred to the Salt Lake City prosecutor for charging and compared how the accused were treated compared to whites. It found minorities were offered the same plea deals as whites, and in all other respects treated fairly. Examining race and justice in Utah may not be completely dead yet. Last year, the Legislature set aside $45,000 for the Commission on Criminal and Juvenile Justice to study if minority communities were being treated differently by police. Results should be ready in time for consideration by the 2008 Legislature.